(Nanowerk Spotlight) Water and energy are intimately linked, much more closely than most people would realize. Electrical energy generation requires water in its different stages of processing, such as raw material processing, thermal cooling, powering of turbines (through steam and water) and so on. Water requires energy to be transported, to be purified for human usage and consumption. However with an increasing population leading to an increased demand for energy and water, the production of both of these resources are becoming progressively important in this resource-limited Earth. A conjoined approach to solving these two problems would definitely be attractive. Due to the scarcity of fresh water supplies and the declining supply of fossil fuels, compounded with environmental issues, a carefully-considered solution would have to address both these problems. Ghim Wei Ho and her team at the National University of Singapore have ingeniously integrated the solutions to these two problems by designing a plasmonic solar thermal collector nanocomposite comprising a Ag/SiO2 core with a TiO2 outer shell as a photocatalyst. The team's nanocomposites possess efficient photothermic properties for highly targeted interfacial phase transition reactions that are synergistically favorable for seawater catalysis and desalination. The nanocomposites are seawater and photostable for practical solar conversion of seawater to simultaneously produce clean energy and water. The work has been reported in the June 6, 2016 online edition of Environmental Science and Energy ("Plasmonic photothermic directed broadband sunlight harnessing for seawater catalysis and desalination"). Ho is excited about the synergy between photocatalytic and photothermic properties. "This work defines the forefront of plasmonic photothermic technology, which is vastly untapped and has broad implications in other fields." This highly stable core-shell structure is specially designed to take advantage of the silver nanoparticles as a plasmonic oscillator to increase the local temperature around the nanocomposite photocatalyst, with the transparent dielectric SiO2 matrix encompassing the silver nanoparticles enhances light absorption while passivating the silver nanoparticles against undesirable oxidation. 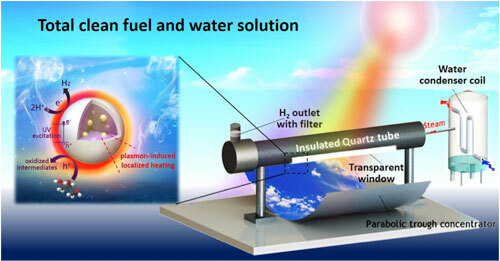 The TiO2 shell is targeted to absorb the UV light to split water into hydrogen and oxygen, while the remaining portion of the solar spectrum is absorbed by the Ag/SiO2 core for localized heat generation that concurrently increases photocatalytic hydrogen generation, as well as for steam generation below the normal boiling point of water due to the nanoparticles acting as nucleating sites for localized steam generation. This allows for an enhanced hydrogen generation by almost twice the rate, as well as a distillation to create fresh water. "This work opens up doors for new designs of broadband sunlight harvesting photocatalyst based on photothermic properties to achieve efficient utilization of solar energy for both water and energy solutions," notes Minmin Gao, the paper's first author. "I will further explore the intriguing photocatalytic and photothermic effects." The nanocomposite has also been tested with seawater, and results show the feasibility of producing hydrogen and fresh water concurrently. This simultaneously allows for energy production in the form of hydrogen fuel, while also producing fresh water for human consumption. This renewable source of energy and water is potentially game-changing due to firstly the parallel approach of generating energy and fresh water, as well as the wide availability of the raw materials which are seawater and sunlight.